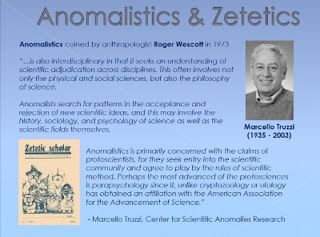 Marcello Truzzi and Ron Westrum co-founded the Center for Scientific Anomalies Research (CSAR) in 1976, two years after Truzzi was forced-out of the Committee for the Scientific Investigation of Claims of the Paranormal (CSICOP). Following Truzzi's departure, CSICOP changed its journal's name to the Skeptical Inquirer. Zetetic Scholar was the journal for open-minded, but cautiously skeptical, proponents of the paranormal -- in response to what Truzzi felt were attempts by organizations like CSICOP to debunk such claims, despite the findings of research and investigations. CSICOP is a known "CoIntelPro" operation which has received funding directly from the US government and private entities over the years in exchange for their "skepticism." Known CoIntelPro (CIA) operative, and professional "skeptic," James Randi, was a frequent contributor. Several issues of Zetetic Scholar are available for download online. The last issue appeared in 1987, and Truzzi died in 2003. CSAR mostly existed as a concept and not a practicing organization. Marcello Truzzi's "zeteticism" translates to "pseudoskepticism."